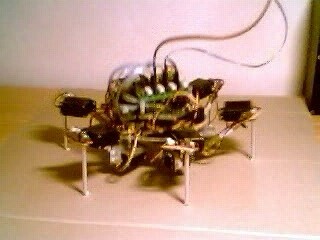 Hi, this is my hexapod walker i develop at home just for the fun of it. The walker is a six-legged walking robot with a three-dimensional movement capability for each leg. in total 18 revolute joints. My web site contains a few demo clips of the robot in action. modular, general and hierarichal in order to be reused in other projects in the future. The servos are standard RC-servos. sending the data flow in the correct speed. I've been working on this project from time to time since 1997.